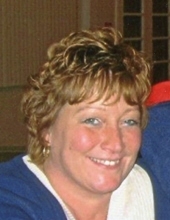 Karen Ann (Holton) Jones, age 55, passed away February 6, 2019 surrounded by her loving family. Loving wife of Paul Jones; mother of Christopher Jones and his wife Kim and Erin Balcom and her husband Glen. Loving grandmother of Dylan, Reese, Chloe, Kelan, Brayden, Logan and Charlotte. She leaves her mother Catherine Bonito of Norwood, her brother Donald Holton of Mattapoisett and her sister Shannon Harvey of Norwood. Aunt of Nicole, Gregory, Nicholas and Alicia Harvey who she lovingly raised. She also leaves many nieces, nephew, aunts and uncles. She had many loving friends. She was preceded in death by her brothers David and Mark Holton. Karen loved music, dancing, cooking, the beach and her dogs Monte and Buster. Her loving nature and smile will be missed by all. Relatives and friends are kindly invited to attend calling hours on Monday, February 11 from 2-6 PM at the Roberts and Sons Funeral Home, 30 South Street, Foxborough. A memorial service will be held at the conclusion of calling hours. To send an on-line condolence please visit the funeral home web site at www.robertsandsonsfuneralhome.com. "Email Address" would like to share the life celebration of Karen Ann Jones. Click on the "link" to go to share a favorite memory or leave a condolence message for the family.